Legend has it that Jesus visited Hemis monastery in the Ladakh region some time between the ages of twelve and thirty, a period of Jesus’ life that we know little about. 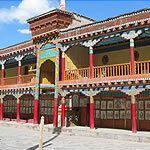 A Russian journalist called Notovich came to Hemis in the 19th century and was shown a document by the chief lama detailing the story of the life of “Issa”, a name which is close to the Arabic word used in the Koran to refer to Jesus. Novotich translated this document which tells of Jesus studying Buddhism. The story was of course deemed heretical and discredited by the church. The original document at the monastery was mysteriously lost, and the tale passed into myth. 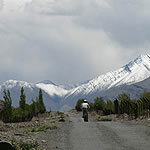 We were told this story by our expert guide as we cycled along the Indus valley, looking up and ahead to Hemis monastery, the deep red decorations on its facade framed by the stark brown of the hills behind and the snow-capped peaks of the Stok mountain range above. The road up to the monastery looked rather too steep for my unpractised cycling ability, but at the critical moment a support vehicle appeared and I was whisked up to the monastery by motorcar. Whizzing down the mountain with sweeping curves and the green plain unfolding below us was great kiddie fun once we were back on our bikes. 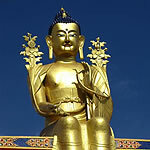 Buddhism certainly dominates the landscape in this remote and at times unreachable part of north-west India. Besides the rich and colourful monasteries and temples you see at every turn stupas containing Buddhist relics, prayer flags fluttering in the wind, mani walls and prayer wheels. The general tourist market has been coming to Ladakh since the 1970s, but my holiday was an experience totally removed from the mainstream. 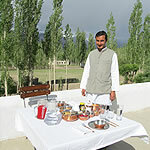 Jamshyd Sethna, a visionary travel professional, is the man who has created journeys that take you off the beaten track and into the heart of village life. 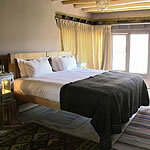 Accommodation is in authentic village houses which have been beautifully refurbished to western standards; they are large enough to house both the families to whom they have belonged for generations and their visitors. One morning whilst staying in the village of Nyemo I heard lyrical chanting in the family’s prayer room; a little later the owner of the house came in to the sitting room with incense – a symbol of peace and goodwill. It was an unscripted moment in village life which quietly carries on around you. The animals are stalled close by, but their presence is never obtrusive. As a guest you are connected to what is going on rather than being cocooned in boutique luxury. People greet you with an up-beat ‘Julai’ (the Tibetan for hello, amongst other things) and are seemingly totally unfazed by the presence of foreigners in their midst. The six houses are taken on an exclusive basis and not shared with other guests. During a week’s stay you might stay in three or four of them. There are lots of smiling staff who are extremely attentive and prepare really delicious food which is often far better than that to be found in the posh hotels in Delhi. One afternoon we climbed up the pass behind Likhir village. The houses soon thinned out as we traced the course of a stream, the swathe of vibrant green pasture on its bank forming a dramatic contrast to the starker brown mountains on either side. 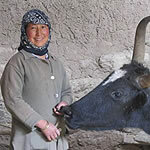 Dzos, a cross between a cow and a yak, were grazing, and a herd of goats was scampering down the path from higher pasture. We saw smoke rising from a low-built stone hut, the summer dwelling of one of the last remaining herdswomen. We were invited in to celebrate the birth that day of a dzo and enjoyed sweet milky tea and Ritz biscuits served on the best china. As we headed back down the valley passing the odd prayer wheel (those visible signs of Buddhism again), the late afternoon sun glinting on stupas and the huge golden Buddha of Likhir monastery way down below, I thought what welcome sights these must have been to traders on the silk route from yester-year. I also thought how very special it was to explore an extraordinary and sometimes harsh landscape which is softened and complemented by the gentleness and inner calm of the people who live there. Activities on these journeys include walking (as much or as little as you like), cycling, visits to monasteries, battlefields and forts, cooking lessons, archery and white water rafting. Mobile camping with proper washing facilities may also be added into the mix for those who want to do slightly more serious walking in even remoter locations. 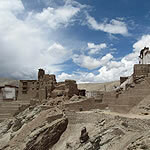 The season for Ladakh is during the summer months from mid-May to the end of September. If this period doesn’t suit we have a similar experience operating in the lower Himalaya areas of Sikkim and Kumaon. 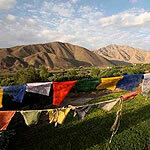 Prices for a week in Ladakh on a fully inclusive basis with a night at either end in Delhi and international flights are from £3,890 per person. Call Miles Barber on 0207 723 5858 for further information.